As the third presidential debate looms, we thought Obama might still appreciate some help in upping his game. 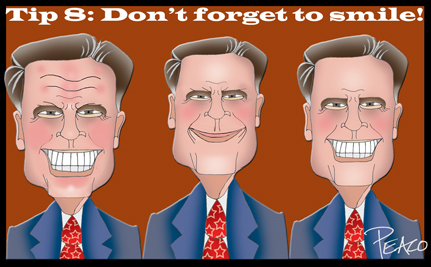 Here are 8 tips from an imagined Romney Debate Playbook. 1. Go light on the details. Speak in generalities; don't give your opponent the opportunity to trip you up on the specifics. After all, if you spell out the particulars, people might find out what you really think. So what if you said something yesterday that you've decided you don't mean today. Bygones! Not too long ago Mitt was pro-choice but now he's against abortion regardless of circumstance. To describe his change of view, he uses words like "grown" and "evolved." However, make sure you use the word "evolution" only in a personal context -- whatever you do, don't mention it with regard to that theory of species progression or anything that contradicts Creationism. In fact, assert that you're creation-ing yourself as you go along! 3. Don't let facts get in the way of a good line. Facts -- and fact-checkers -- are pesky little things that can pin a candidate down. Telling the truth? That's a strategy for losers! 4. Claim your opponent is doing what in fact you do. This psychological ploy has been used to great effect by everyone from cheating spouses to cornered politicians. It's called "projection." Running around on your wife? Accuse her of infidelity first! Stirring up class anger and resentment? Say that's what Obama is doing. It's the Republican way! Don't take a stand on an issue -- you might alienate people who support a different position. Mitt has turned flip-flopping into an art form; he employed this tactic when pressed on his plan to slash taxes for the wealthy and his true feelings about the "47%." When he is about to get caught in an outright lie, he beats a hasty, and strategic, retreat into "I can't remember" land. 6. Tell people what they want to hear. Who needs bad news, even when it's true? Don't bring people down with talk about austerity and sacrifice. Paint a pretty picture. And if your opponent brings up any harsh realities, do like Mitt and just say it ain't so! Then accuse him or her of "not believing in America." Works every time. Don't be a slave to the clock! 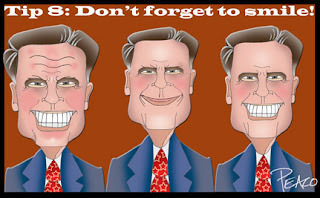 If you run out of time, well, just keep going -- that's what Mitt does. His long history as a bully (from cutting a gay classmate's hair to pet abuse to large-scale layoffs) has taught him how to roll over just about anybody. But be sure to get all righteously indignant if your opponent tries to finish a sentence after the bell has rung. 8. Smile. Smile. Smile. Smile. SMILE. Don't forget to smile. All the time. No matter what the topic of debate. A smile says, Hey, look at me -- I'm the man! A smirk is okay. A smirk, especially when your opponent is talking, says, Can you believe that guy? But a thoughtful, even pensive expression might suggest that you're contemplating the nuance of an issue -- what a concept! There are no nuances in Mitt's Playbook -- there's only his firm and committed position du jour. Blind the people with a dazzling smile and they might forget to look for what you're hiding. Despite continued pressure, and the specter of an issue that just won't go away, Mitt Romney still refuses to release most of his tax returns from the last decade, a decade in which he served as CEO of Bain Capital, parked money in off-shore accounts, and found a way to pay, as his 2011 return indicates, far less tax than your average school teacher. It's hard to imagine that his refusal to come clean is simply arrogance -- it's hard to imagine that he's not hiding something, something big, something for which he's willing to pay the price of keeping the questions about his finances alive and unanswered. What could it be? Here are four whimsical speculations and a deadly serious question. Mitt's returns indicate that in addition to his eldest wife Ann, he supports several more sister-wives, thus upholding a venerable Mormon tradition. Since Mitt has claimed that he pays only the minimum amount of tax owed, and not a penny more, he didn't hesitate to make full use of these deductions in order to reduce his rate to a desirable 14.5%. 2. Marriage exemptions version 2. Mitt's returns indicate that in addition to his eldest wife Ann, he supports several more wives, only these are brother-wives, thus begging the question: are his diatribes against gay marriage a case of "he doth protest too much"? 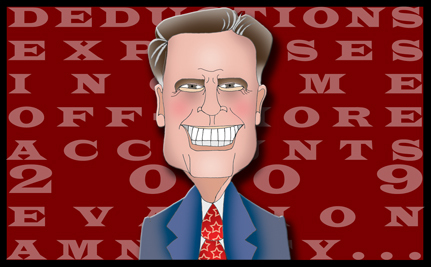 While Mitt isn't anxious to reveal that among his many business ventures is the R-Money chain of for-profit abortion clinics, he is particularly proud of their slogan: "R-Money Can Fix UR-Problem." 4. Business expenses version 2. It might seem counter-intuitive for Mitt to advocate overturning Roe v Wade in light of his abortion-clinic profits (see above), but as his tax returns show, Mitt is ever resourceful. If he is elected president, and is successful in reversing abortion legality in the US, R-Money is poised to go offshore and open for business in China and Mexico, places with which his other outsourcing activities have made him quite familiar. In addition, promoting abortion in Mexico will help with his Latino problem by reducing the number of immigrants and potential Hispanic voters. 5. 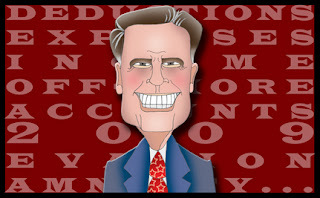 Was Romney a tax evader in 2009? In a recent Huffington post, Anthony Badami raises a disturbing question: in 2009 did Mitt Romney take advantage of an IRS tax amnesty program for tax evaders? Is that why he refuses to release his 2009 tax return? If that's the case, then the GOP presidential candidate committed a federal felony, one for which he applied for, and received, amnesty. Now, in this silly season of half-truths, exaggerations and downright lies, that's a fact that certainly would shake up the race even more than Romney's bully-pulpit (well, just plain bully) debate performance. "How can you tell when a politician is lying? When his (or her) lips move." That's a tired old chestnut, but the truth is, whether assessing a candidate or a loved one you fear is cheating, human beings are pretty lousy at detecting deception. Politicians can be especially tricky to catch out since most of them have had so much practice. Between spin doctors, speech writers, media consultants, pr managers, sycophants and their own often monumental egos, those who would dine at the public trough are trained to stay on message and exude confidence, sincerity and trustworthiness. Perhaps more importantly, they develop a keen sense of what we, the citizenry, want to hear: we warm to positive messages and flinch from painful truths. And because so many of us are woefully ignorant about the details of the issues, we like sheep are easily led. The best defense against a lie is knowledge. If your paramour insists that he was watching the Sunday game with his buds but you happened to catch a glimpse of him in the lobby of the boutique hotel where you'd had brunch, well, there you go, both metaphorically and probably literally. But apart from firsthand knowledge (or other reliable evidence) are there verbal and nonverbal clues that can give a liar away? Lying is harder than telling the truth. Lying is stressful. To be an effective liar requires that one rehearse and memorize detail rather than rely on memory. Because of the anxiety associated with lying and the perceived sense of the importance of the lie, the liar often will give him- or herself away. This is especially true of politicians since their lives can be exhaustingly busy and lies require energy and constant attention. Experts tend to agree that none of the standard indicators is completely fool - or politician - proof. Some people are simply really good at lying. Many signs, such as the fleeting facial tics known as "micro-expressions," are extremely difficult for a lay person to distinguish. When applying these clues to detect lies and liars, it's good policy to temper hubris with modesty: understand that you might get it wrong. But careful use of them might help you get it right. It's a myth that liars won't or can't make eye contact. However, look for unnatural eye contact: either the person is unable to maintain contact or s/he fixes you (or the camera) with a strained and aggressive stare. Pay attention to such indicators as crossed arms or legs, slouching, or tilting the head away: these can indicate the discomfort that accompanies lying. Many researchers posit that when the eyes look up and to the right (his or hers, not yours) this suggests that the part of the brain linked to the imagination is being triggered. Conversely, the eyes looking down and to the left might indicate the part of the brain linked to memory. 4. Shake out the hands. Often liars' hands will speak eloquently of deception. Watch for clenched fists, covering the mouth or part of the face, rubbing the eyes, scratching on or behind the ear. 5. Pay attention to detail. The person who offers too much detail, especially unasked, might be lying. Because the narrative of the lie is fabricated, the liar can often be tripped up by inconsistencies in the story, especially if the same questions are asked after some time has passed. Politicans' lips move and it's not always lies that emanate. To truly become a lie detector, you need to arm yourself with knowledge, information and intuition. 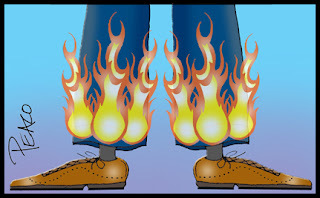 But if you do notice someone's pants on fire….